This week is my last official week on placement with Bottle Blonde as my deadline is today, although I shall still be working at Bottle Blonde for another 2 weeks before I leave. My entire industry year has been an eye opening experience. I’ve learnt so much about how the industry works, skills that I’ll be forever grateful for in my final year and built upon skills I’ve learnt throughout my first 2 years of university. Reflecting back over my year I personally feel I have grown as a person and a designer. I have more direction and determination in my life and I have more ideas about what I would like to do for my final major project. I have learnt how to work better in a team, how to present my ideas and final products better as well as developed how I design. During my final official week I have been designing more packaging for Bottle Blonde. My main focus for the week has been on how to develop our current packaging further to make it more instagramable which would increase our sales. 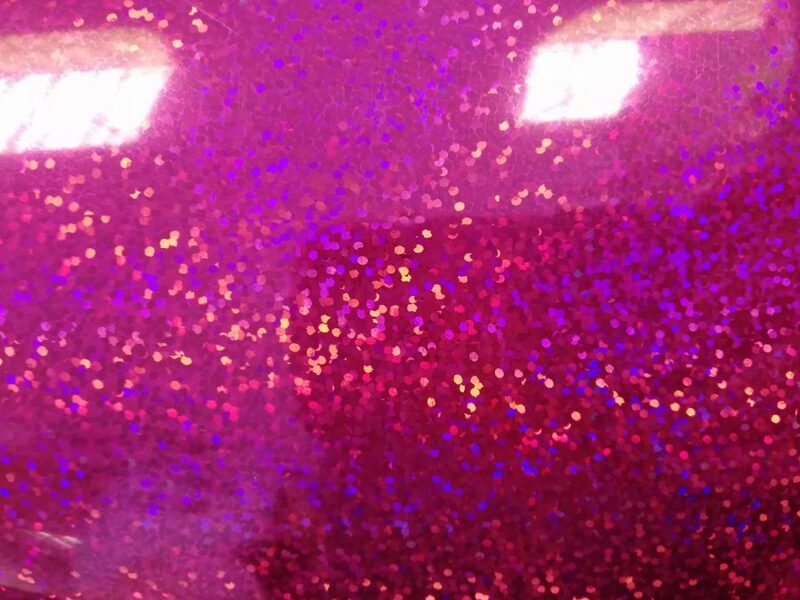 The more extravagant and stunning we make our products and packaging the more people want to take photos for their Instagram the more sales we have. 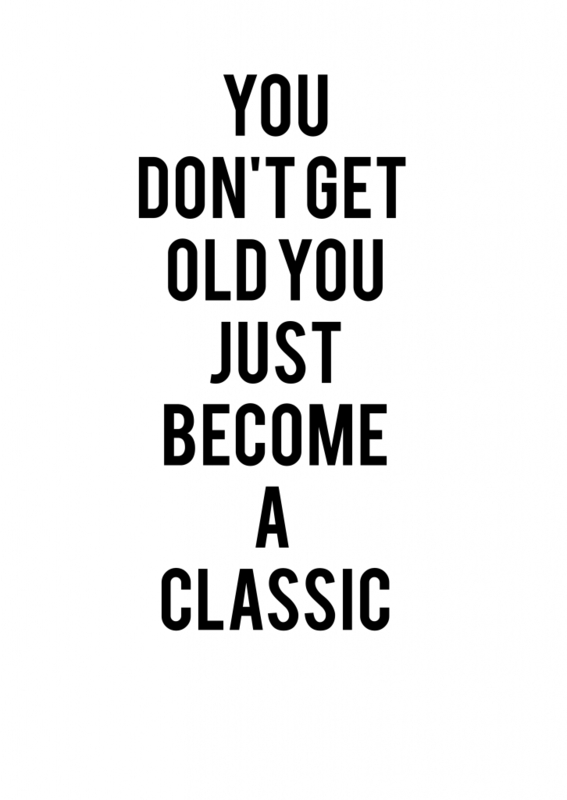 So I looked more at phrases we could easily cut out in vinyl and stick on to any of our current packaging. I focused on cute catchy phrases that reflect our customer basis which I have grown to understand more throughout my time at Bottle Blonde. Overall even though I haven’t finished yet I have had an amazing enhancement year and would recommend doing one to anyone given the opportunity. If this unfortunately isn’t something offered to you as apart of your course you can always do summer internships and other holidays, as many companies offer shorter placements for holidays. Industry years help you solidify your knowledge, learn new skills, generally develop. I am more confident to go into my final year in September and hopefully I will come back with updates on my final major collection. Month 5 and nearing the end of my internship year. The past month has been unusual but exciting with a trip to Iceland, week at home getting to do hand drawn pieces, designing shoes and drawing animal skins. Shoe design and construction, during my first year we learnt about shoe design and construction. As I have been designing shoes for Bottle Blonde recently these skills have been of great help in my initial shoe shape design. Understanding how the base of a handmade shoe is created helped me understand to an extent what is and isn’t possible so that I didn’t design any completely infeasible shoes. Textile appliqué, when designing shoes I needed to consider how the prints could actually be applied to the shoe. So for some of the designs I specifically designed them with the theory of the patterns being in appliqué. This skill widened my options of design rather than keeping everything flat and digitally printed. Drawing animal skins, at Amanda Kelly I learnt about how they draw some of their animal skin prints however while there I never got the chance to attempt to draw any myself. Now that I’m at Bottle Blonde I have gotten to experiment with how to draw some skins in lovely neon colours. Learning about how to draw them has really improved how I draw them and has resulted in some wonderful and adaptable prints. Hand illustration, in my first year I learnt about fashion illustration and how it doesn’t need to be as generic as I originally thought. Learning more about fashion illustration and abstract illustration has been useful for creating unique prints and widened my skill range for design. Colour changing in Photoshop, whilst working in London I learnt about how to colour separate a pattern for screen printing. However I discovered that the tools required to do this can also be used to change the colours of a pattern swiftly and smoothly. 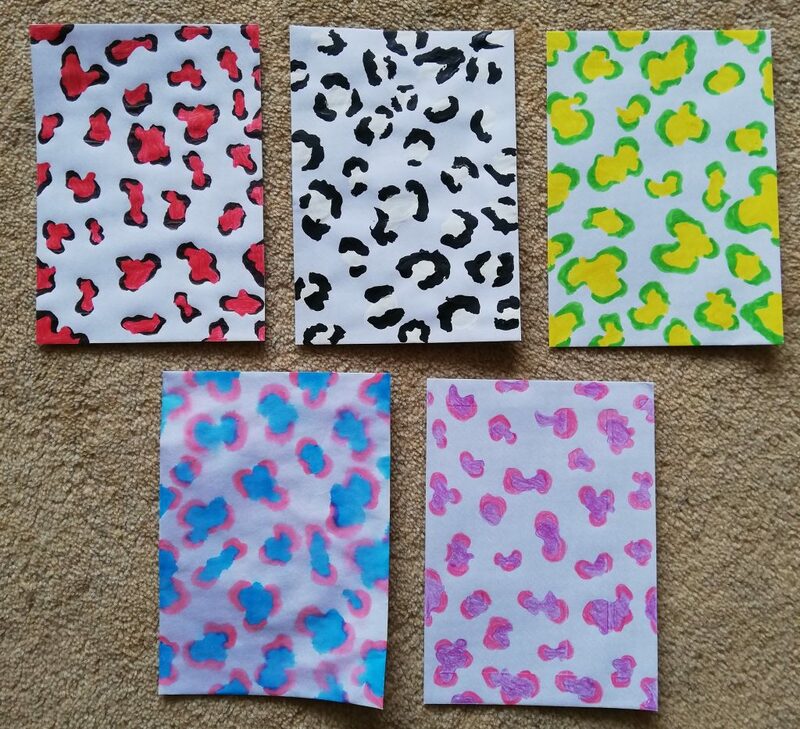 Drawing animal skins, as I have been drawing animal skins for Bottle Blonde I have developed how I can draw them as well as the types I like drawing. I feel if I make a collection in my final year I want to do my own prints, being able to draw skins gives me a wider range of prints I can do. Shoe detailing, when designing shoes there are a lot more details to a shoe than I had ever thought about prior to my project. Researching platforms has widened my understanding about how much thought and creativity goes into designing shoes. Presentation of print designs digitally, over the year I have learnt a lot about how to develop my portfolio pages and present digital prints that haven’t been applied to physical products. As I am looking at lot at potentially working in print design as a career I need to develop my print portfolio and understand how to present it in a layout that visually shows the full potential of my skills. Multitasking, when working in the fashion industry the ability to multitask is key. As you could end up working on 3 different things and then need to balance your personal life on top as it’s an ever changing industry. Over the year I have learnt a lot about balancing my time and multitasking which will be useful to maintain my mental health in my final year. 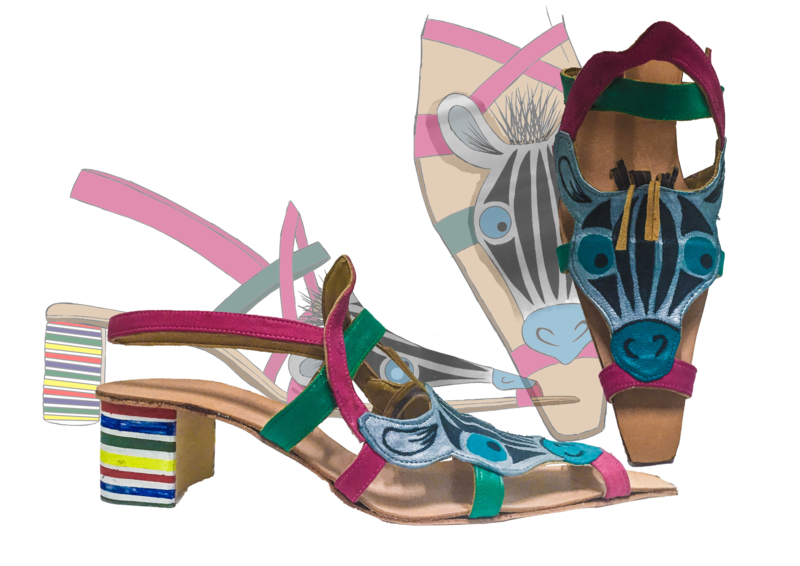 Multimedia design, whilst working on my shoe project I have really gotten to experiment with multimedia designing. In order to design my prints I have been using photos, paint, watercolour, markers, pens, glue, sticky notes, anything I could get my hands on and it’s really given life to some of my designs which otherwise would’ve been flat. This will be useful for again designing my prints in my final year if I choose to do a collection. I’ve been back at BB HQ and catching up on everything that’s been going on the past 2 weeks. Whilst Chloe has been away the team who were in the office were very productive and got lots of orders sent out. At the beginning of the week I met with one of the other interns to talk about our shoe designs and look at each other’s work giving feedback. Looking at each other’s work and seeing the different approaches helped us both with developing our work further prior to showing it to Chloe for the final shoe choices. Peer feedback has always been incredibly helpful at uni to ensure the best sketchbooks and I have found out also useful in industry when working in small teams. After our catch up the work for the week began and this week I have been dipping in and out of different areas getting to learn more about how products are made, designing web graphics and designing packaging. I began with learning more about how the iconic jackets and earrings are made. Chloe wants to reshoot the dolly earrings in all colours which involved us making new pairs in every colour. 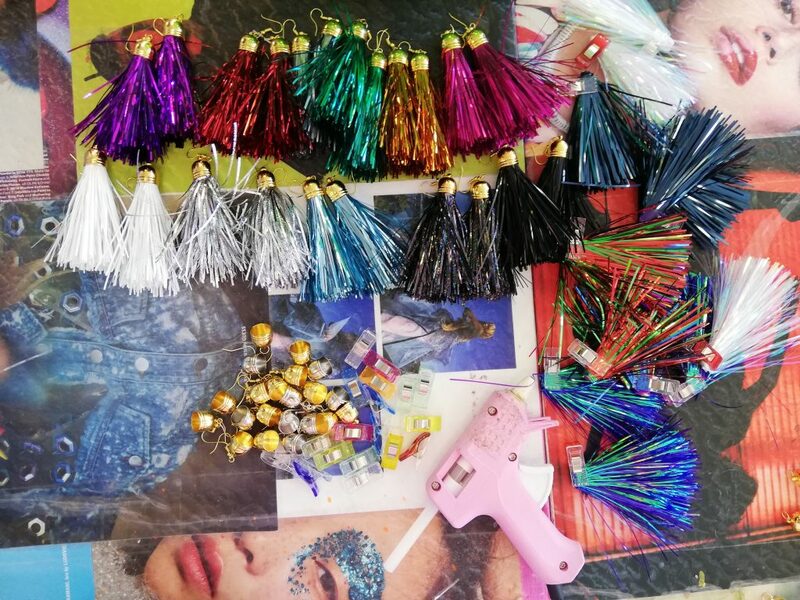 I had previously made keyrings with the team for an event so I had some mild knowledge of how they are made but this time I got to do more of the assembly rather than just folding tinsel in half. The earrings were assembled quite easily for my hands although I did nearly burn my hands a couple of times. Although my hands don’t function fully I loved getting to be a bit more hands on. Jewelry construction is something that has always been of interest to me and I feel these skills combined with our workshops from first year have potential to develop even if only for personal use. 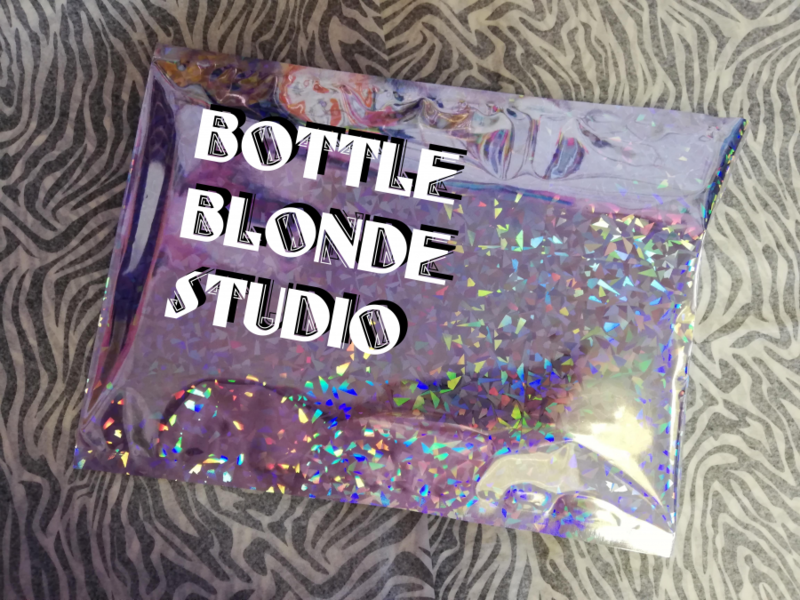 I also began designing some new packaging for Bottle Blonde, not only am I designing shoe boxes but general clothing and accessories packaging and graphics to be put into the packages. Of course like any project I instantly started researching what exists, what could be innovative for us and what I need to achieve with said product. I chose to focus on shoe boxes first as that is the only product we intend to produce currently that we don’t have any packaging for. 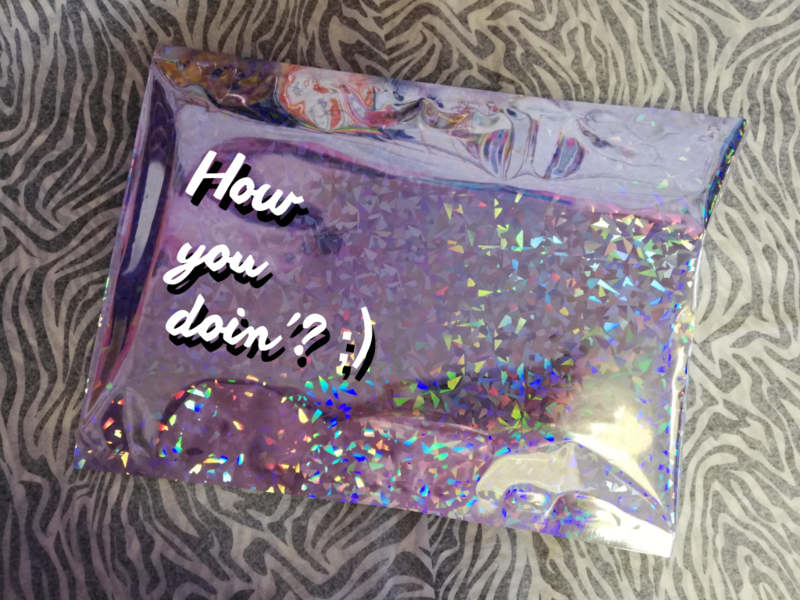 I researched into some recycled packing ideas with an aim to reduce the waste at BB. However as the final shoe choices haven’t been made yet once finishing my initial research I moved onto researching if our current packing could be adapted. 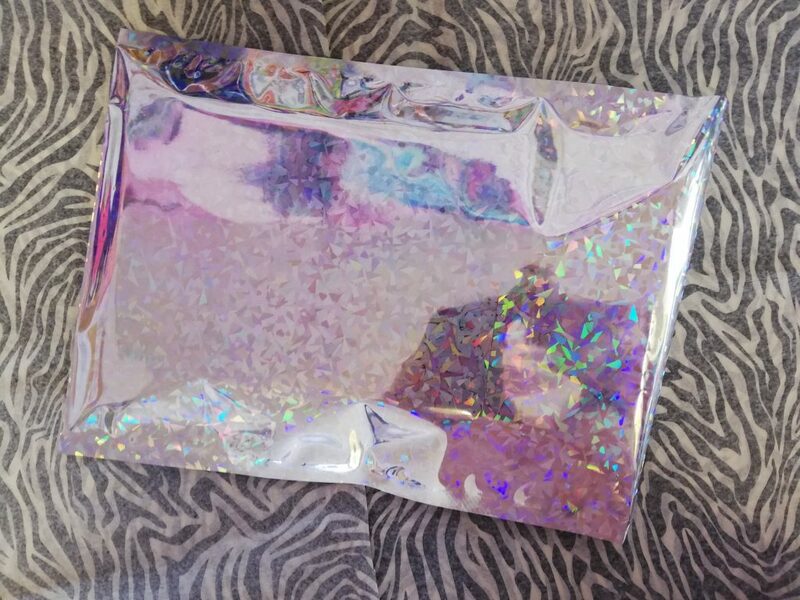 As we do reworked vintage jackets, graphic tee’s and personalised bags, I chose to look into stick on features for our current packing to make it even more extra than it already is. In order to design them I took several photos of our packaging and then began to write and edit phrases straight onto the packing to give a more visual concept to show Chloe. This is only the beginning though and I shall be developing and researching more and more to create hopefully some sustainable quirky packaging. Finally in my personal life this week as it was Mother’s day I went home for the day to see my family. We took mum out for a meal and generally tried to relieve her stress for a day. I have also began to look into places I wish to visit for inspiration towards my final year and planning these trips out with my boyfriend. As September draws ever closer I feel strongly that whatever I do I want to incorporate as much digital elements and my print skills as I possibly can. This week has been rather dull in terms of work, as Chloe is still away I went home to Leicester to continue working on my shoe designs and a couple of shoe box designs and see my family. As I’m at home I have access to all of my art supplies so I took the opportunity to experiment with some hand drawn skins. I learnt about skin drawing whilst I was working at Amanda Kelly in London and thought this would be the perfect opportunity to try out my skills and see if I have improved. Normally because of my hand issues I draw everything on my computer as it’s painful drawing on paper. 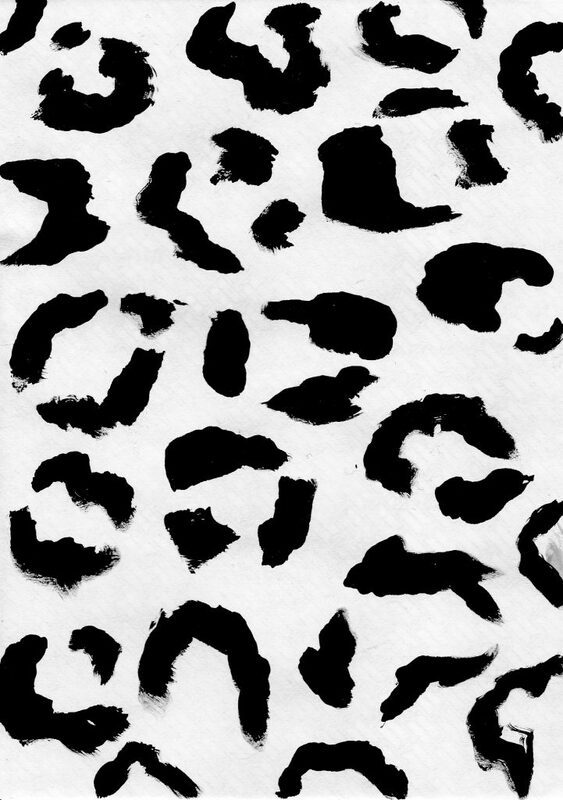 However when trying to draw leopard prints on a computer I haven’t quite mastered how I wanted them to turn out yet so I tried drawing them by hand as I was taught to do in London. I’m personally rather happy with how they turned out, and I hope Bottle Blonde will be equally happy with the designs they are incorporated into. 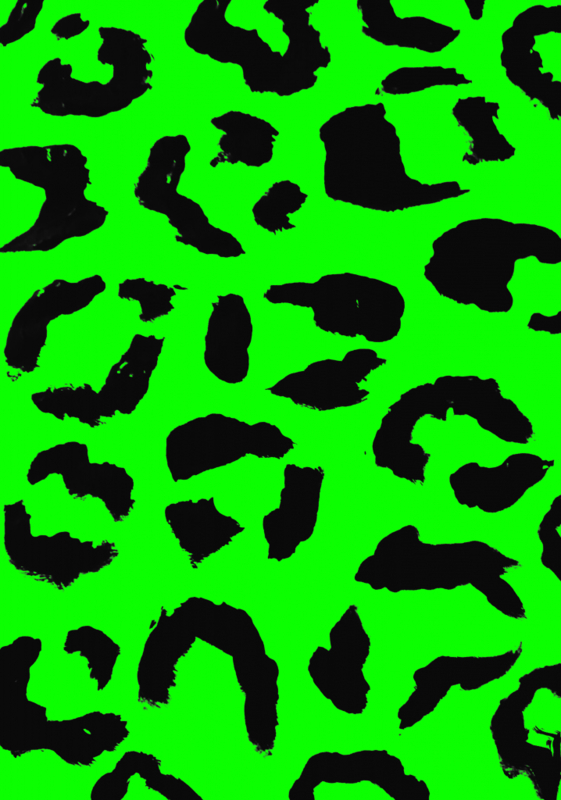 You can see my leopard skin print attempts below. 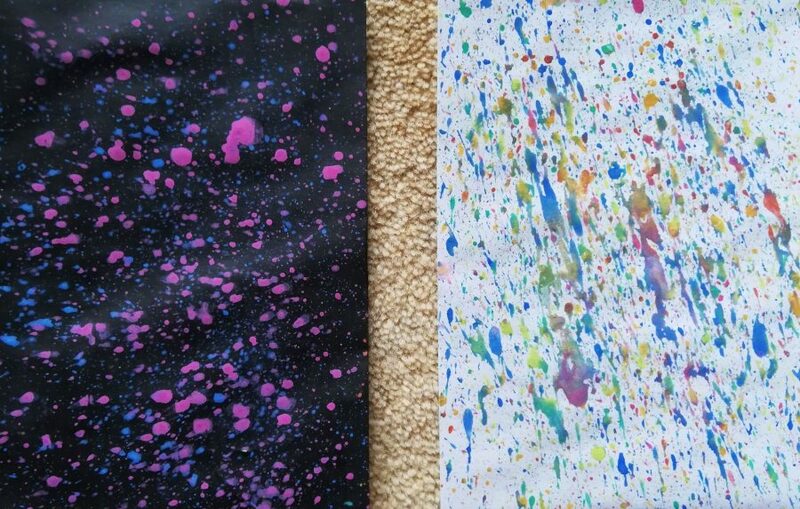 I also took the opportunity to do some splatter paint prints as this is extremely hard to achieve the same effect on the computer. Unfortunately I didn’t have any neon paint to match in with Bottle Blonde’s colour scheme, however with a bit of Photoshop using some more skills I learnt about prints in London it was easy to change the colours to fit in. 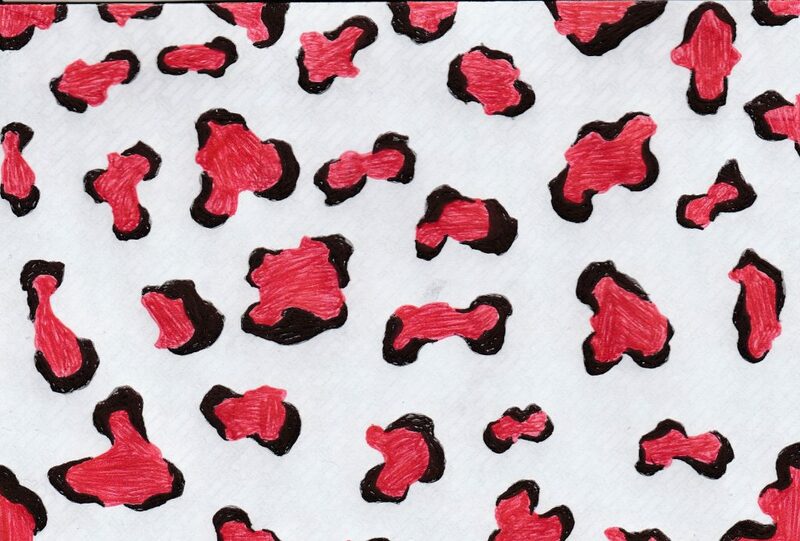 Once I had drawn all my different styled leopard prints I scanned them in and got to work. I learnt about how to colour separate patterns whilst working in London but discovered the same tools were extremely useful for changing colours of patterns and smoothly adding hand drawn elements into my prints. Below you can see the original scan of a print and then an example of how I have photoshopped the background and strokes to make sure the print was even. In my personal life this week as I have been home for the week I went to pottery with my godmother and had great fun painting and molding clay. 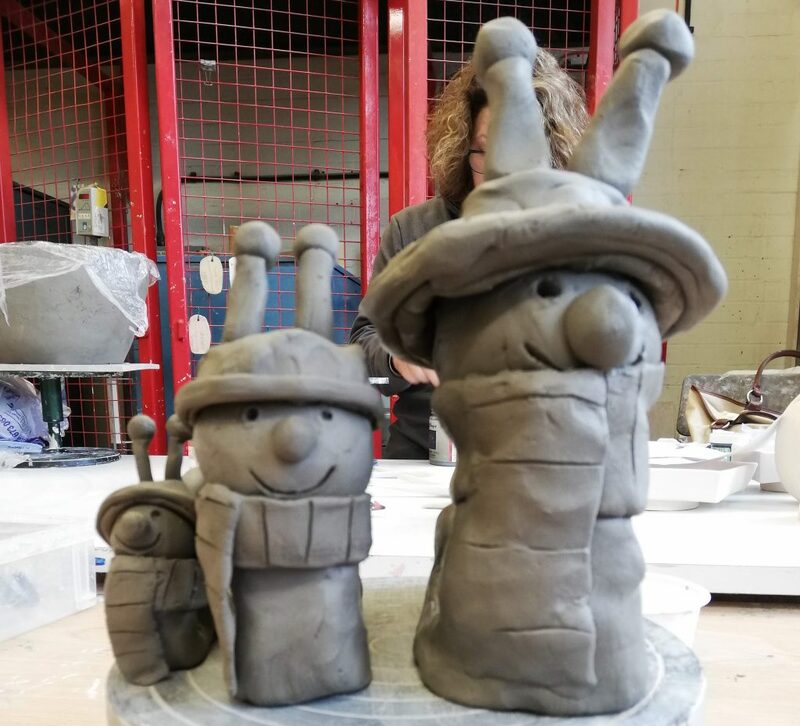 I decided I wanted to make 3 Brian the snails and I was given a gnome and inspired by my godmother to paint him to look like my boyfriend which turned out wonderfully. This week was an unusual week in terms of work space as I started the week in Iceland and then have been working from home for the rest. I’m going to be working remotely for 2 weeks including this week as Chloe the founder and owner of Bottle Blonde is away for her sister’s wedding abroad. When designing patterns I often find that a lot of my time is spent drawing elements that can be reused in other prints. As I am working for one brand producing prints for exclusively their company I can reuse shapes when designing patterns. However if I were working for a print design house for example Amanda Kelly that I worked for in London, I would not be able to as they sell to many different brands and it could jeopardize the company if they sold 2 similar prints to different brands. Designing prints for Bottle Blonde however it is helpful for me to have this database of elements that fit in with the brands vision, this includes shapes, patterns for example checkers and skins. When it comes to drawing skins I learnt that there are endless ways you can draw them and they still not be the same however when selling a skin they can look too similar for sale. For my shoe designs I’ve decided to put into practice some of the knowledge of skins I learnt in London and attempt to draw some myself. 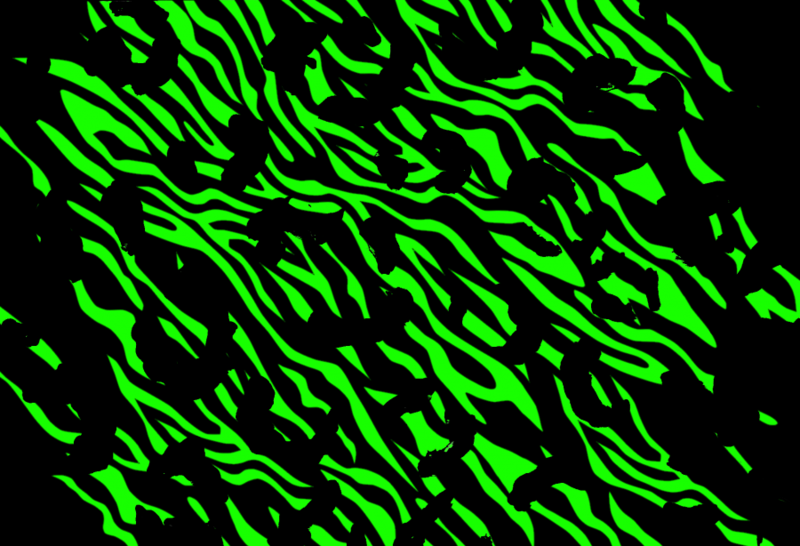 I chose to begin with a Zebra print as I wanted to try and keep as much of my illustration digital this week. To draw the zebra print I researched zebra prints and took several as inspiration for my own. 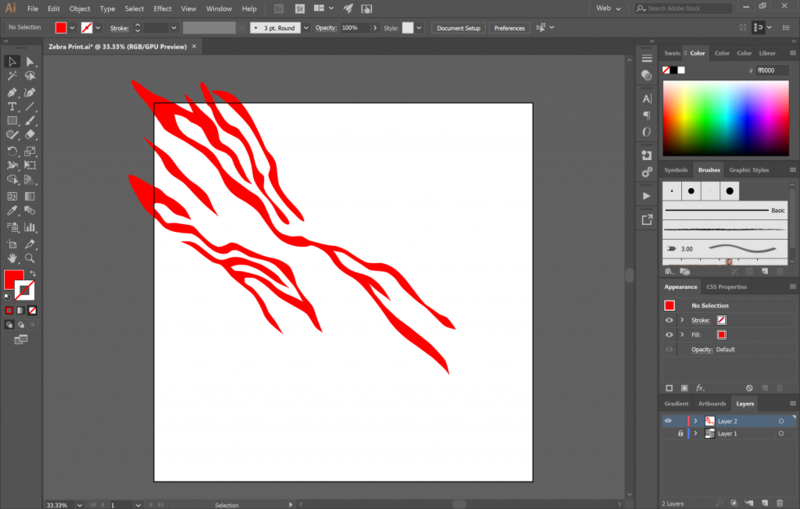 I chose to use illustrator to draw my first zebra print as I wanted to achieve a very graphic rather than realistic as you can see the beginning of below. Drawing on illustrator is something I have done a lot of whilst working for Bottle Blonde and it’s helping me to improve my accuracy skills which aid’s my flat drawings. However as I have done so much drawing on illustrator I’m looking at how I can make my prints for free flowing, more natural and see if I can add hand drawn elements in, so hopefully there shall be some interesting things to come in the next few weeks. In my personal life this week I have been asked if I would like to join a project to design and build website for Dance Research. I was very surprised to receive the email asking if I would like to take on the project and am excited to help them build the site they want. Hopefully I’ll be able to build my own web design skills as well as help them achieve their goals with the site. A brilliant bonus is that I will also be getting paid for creating the site, it’s not much but with an unpaid placement year and bills to pay it’s great. This week was the return to Bottle Blonde. I was ecstatic to be going back to Bottle Blonde and work on more prints and designs for the company. Currently we are working on producing the first set of manufactured clothes for Bottle Blonde and my task for the next couple of weeks is to work on unisex shoes and the boxes to go with them. Like with any brief I began my week researching the style of shoe Chloe wants to be produced. 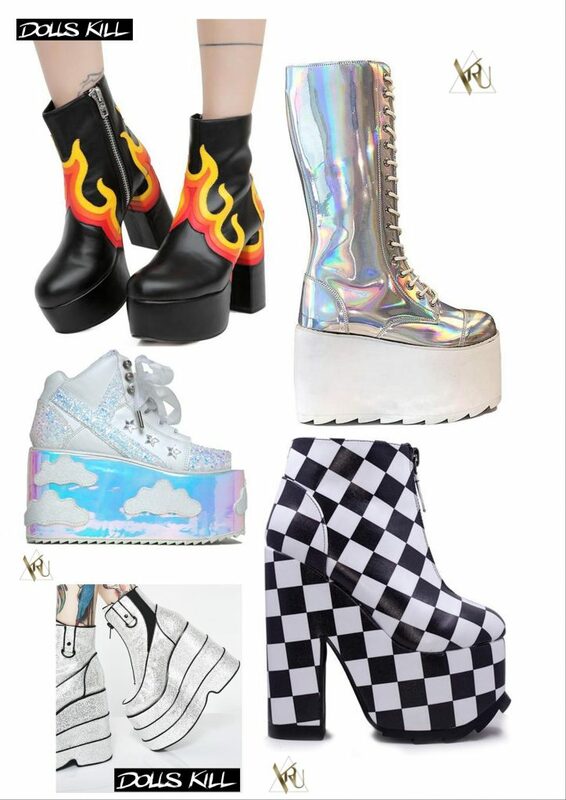 As the brand is very bold and 70s/80s/90s we are designing platform boots as the first shoe the brand will produce. I spent most of my week researching the shoes, styles of patterns and how they could be applied to the shoe, for example printed, embroidery or appliqué. Towards the end of the week I started to develop my shoe shape inspired by my research and my personal shoe preferences. Below you can see a page of my shoe research from the internet. Once I developed some initial shoe shapes I could start to design some prints for the shoes which I can’t show you quite yet but I feel they strongly match in with the brand. Working on shoe design is very different to all other internship work I have done so far this year as rather than just designing a print it’s for a specific product and I am able to design the product which it’ll be on. This has allowed me to put into practice my design skills and understand more how I could work print design into my final major project. 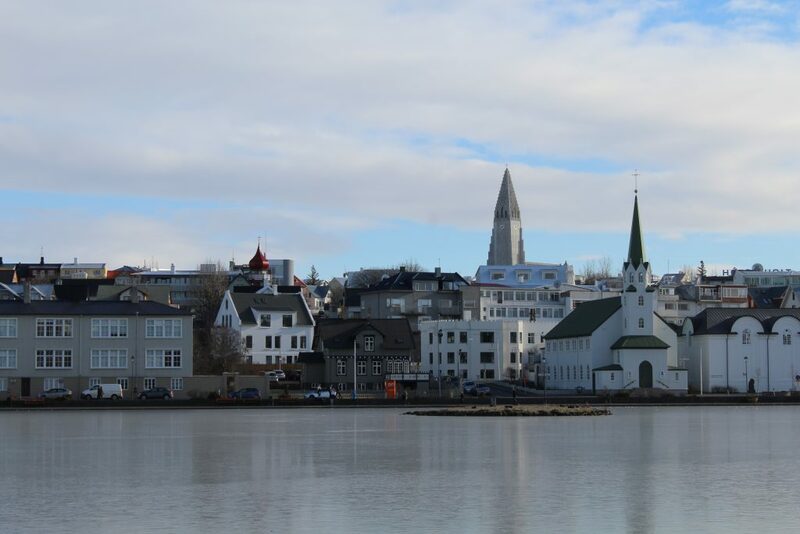 Finally in my personal life this week I actually went on a short holiday to Iceland! And no I’m not on about the supermarket. Me and my boyfriend went on a long weekend away to Iceland and it was one of the most amazing experiences. My trip has begun to inspire ideas for my research for my final major project and I took some amazing photos whilst there. 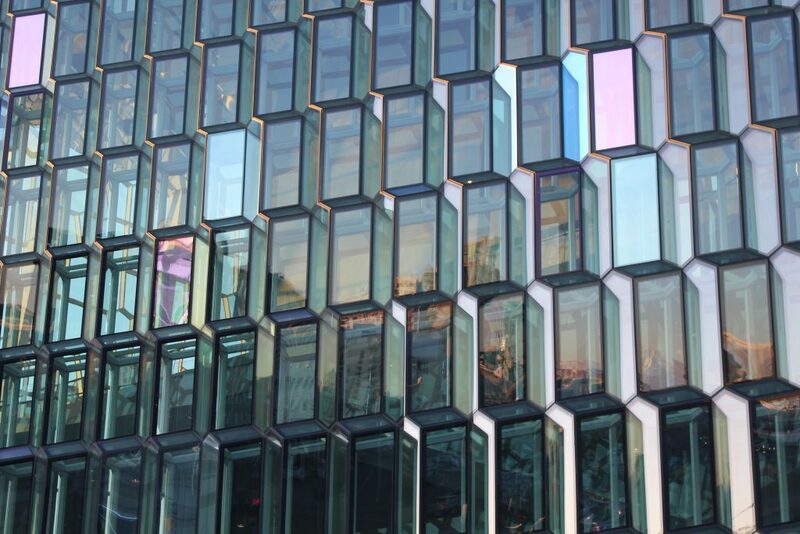 If you ever get an opportunity to go to Iceland I would fully recommend going. Over the past 4 months of working in the industry I have developed a lot in terms of self confidence, skills and goals in life. In this months summary I’m going to highlight not only skills I have put into practice and skills I have learnt, but also skills I want to improve on which I think will be helpful in my career. Marketing, During my second year we were given briefs in which we needed to design packaging and marketing campaigns. Learning these skills about how to layout visual pieces helped me to create a my own magazine styled print for Bottle Blonde which looks professional and bold. Self motivation, A lot of our projects at uni are very self lead. This means we have to be very self motivated to do the work without supervision. 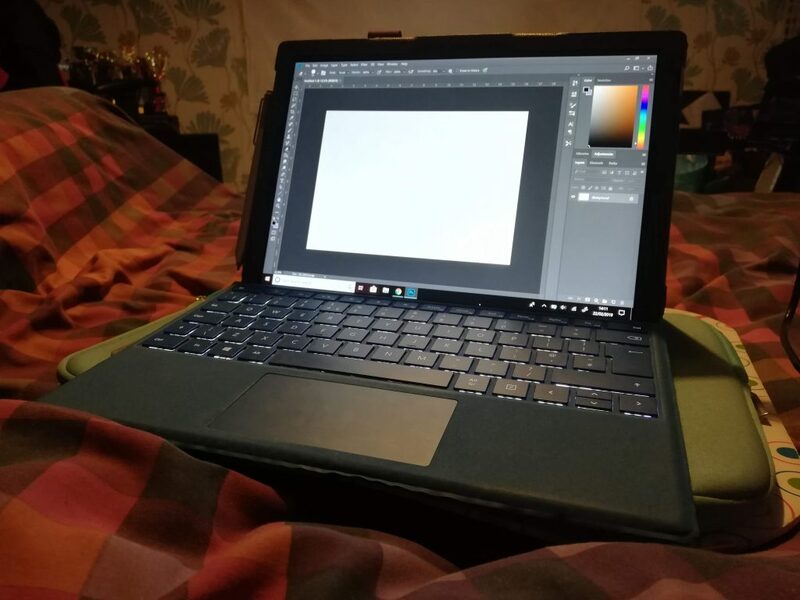 This self motivation has been very important for my time working remotely for Boodcia, as working from home can make you feel more drowsy and be distracting but from doing projects for university I have developed my self motivation to be able to stay focused in this environment. Timekeeping, With many deadlines for university timekeeping is a key skill. As I’m a design student timekeeping can be even more critical to a successful project as you ideally need to complete the basis of the brief well before the deadline to be able to then develop it even further creating a stunning final piece. 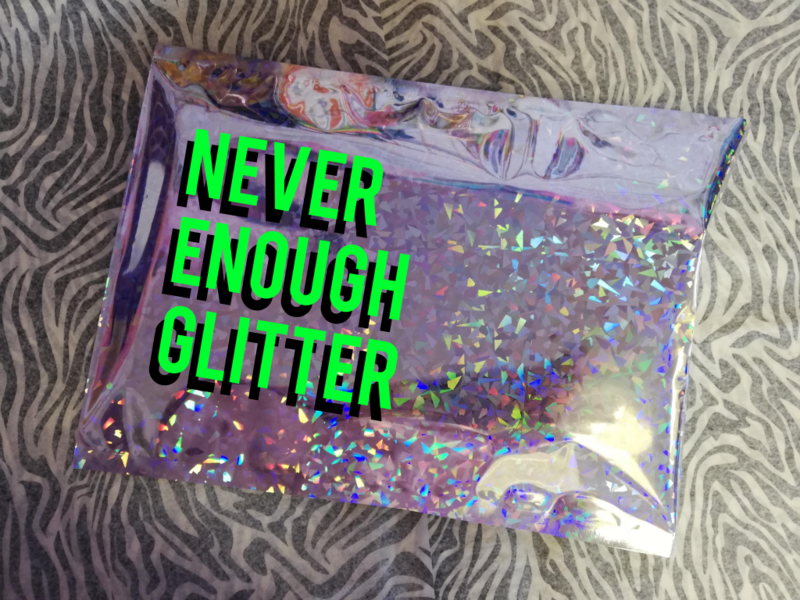 This skill has been very useful for me to create ideas and develop them within a time limit working for Boodcia, allowing me to create unique designs without running short for time. Clothing Design, Of course being a fashion student one of the main skills we learn is clothing design which so far through my internship year I haven’t actually gotten to do. However with Boodica I finally got to put into practice my design skills which was great and allowed me to design new silhouettes for the brand. 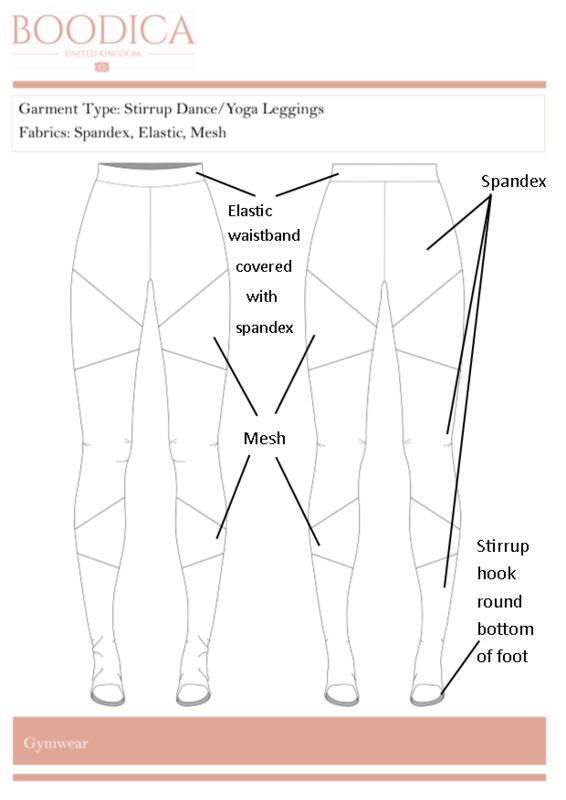 CAD’s, With clothing design comes CAD drawing, CAD’s are the flat drawings that can be sent off to manufacturers which clearly show how the design should be sewn together. CAD drawings is one of my strongest skills I have developed at university and now I have gotten to put it into practice I am even more confident in the quality of my flat drawings. How to make a gif, This skills although some may question how it could be useful in my final year I believe will come in use somewhere. GIF’s can be an innovative way to make a flat project more interactive and being a heavily digital designer the more digital and interactive I can make my work the better. 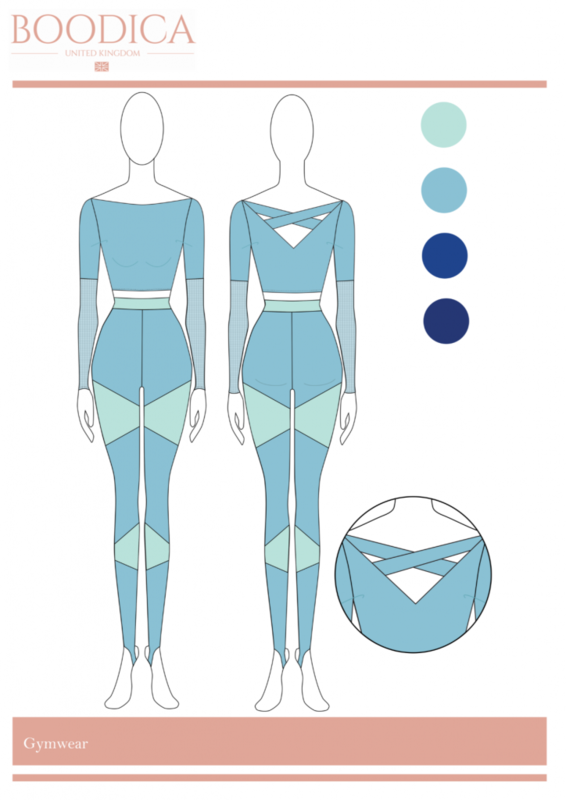 Design pack, Whilst working for Boodcia I was given the task of assembling a design pack which was a pdf of the garments drawn in CAD format on bodies, CAD’s alone and fabric suggestions laid out in a clear format. This will be helpful in my final year for designing portfolio pages that show off my CAD skills and some garment technology knowledge. Graphic design, As I am doing a lot of graphic print design at Bottle Blonde I have learnt more and more about graphic design. This will be helpful in my final year for not only developing my portfolio digitally but developing my sketchbook layout as all my of sketchbooks are digital also. 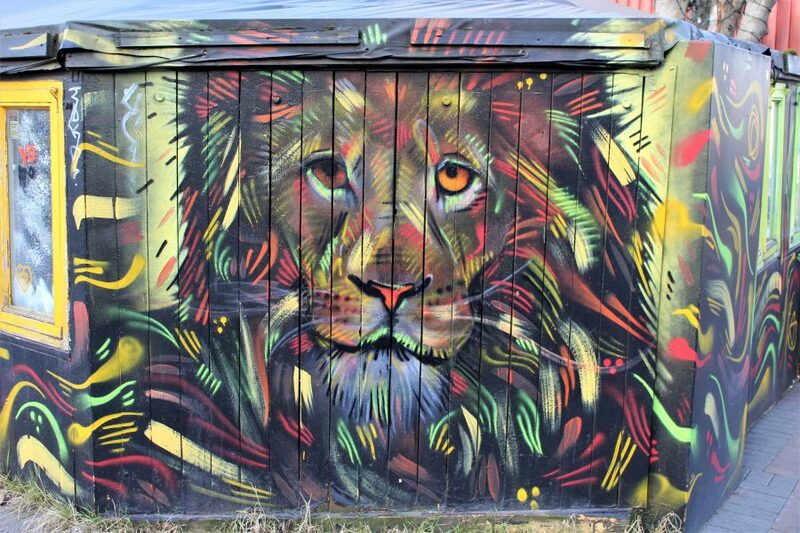 Self confidence, Personally I have lacked self confidence in my work usually thinking it’s not good enough, it doesn’t look professional, other people have better skills than me. However over my time working in the industry and even interviews prior I have developed a lot more self confidence in the work that I produce and myself as a person. Believing in myself will be key in my final year to developing a final major project that reflects me as a person and my skills. How to draw mesh on a CAD, Working with Boodcia on sportswear I learnt how to draw mesh into CAD designs without any preset tools. 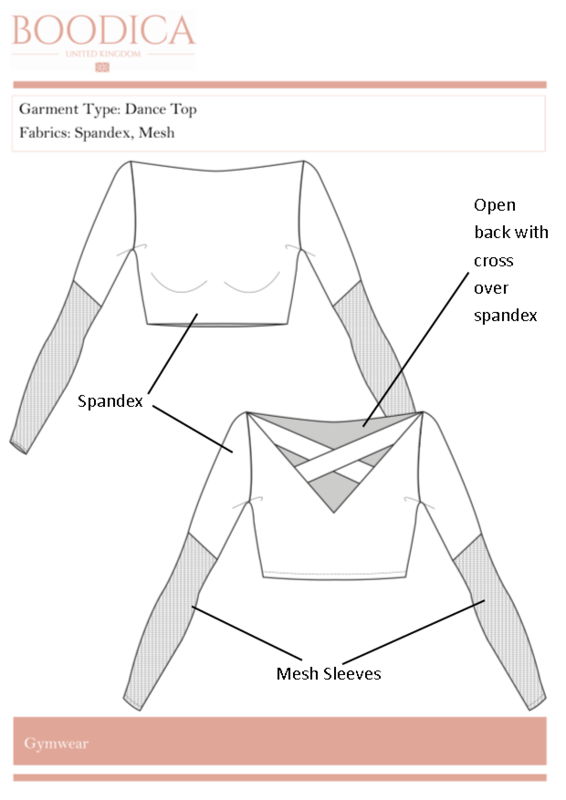 This will be helpful in my final year if I choose to do a collection and decide to include mesh panelings, because of my hand issues if I am unable to sew myself it’ll allow me to set up someone else to sew the garment together without my presence. Marketing, I had a lot of fun designing magazine covers for my print for Bottle Blonde and it’s made me curious about developing more skills in marketing which will also help with my portfolio and website layout. Photography, This is a key skill for creating shoots of my collection however it’s something I have become increasingly more interested in during my year especially with running a blog I want to include my own photography with the best photographs I can take. Illustration, Over the course of the year so far I have done a lot of print design which I have discovered I rather enjoy however as I work very digitally I want to redevelop my illustration skills to my current capabilities to design prints to their full potential. Sewing, I personally think I have quite good sewing skills however after a year of not sewing and my hands becoming more restrictive it’s something I want to improve on to make sure I am able to sew as much as I can in my final year. Coding, From running my blog for my placement year I have found I really enjoy blogging and it helps relieve my anxiety. However I would love to learn more about coding in order to give me more freedom with the setup and layout of my blog and any future websites I run. This week was rather slow in terms of work with me spending the whole working week drawing the CAD’s or flat designs for the chosen approved designs. CAD’s are something I have a great amount of skills in but that doesn’t mean they take any less time to draw. I did however create a design pack of the chosen designs to be shown to a manufacturer and with some editing be put into production. I had never done a design pack before so I learnt how to assemble a pack. In the pack I had to include, the garments drawn on a figure in colour (although these don’t need to be the final choice colours), fabric suggestions which I struggled with not knowing much about gym wear however from some deep research I managed to make some good suggestions however the manufacturer will change it to a more precise fabric, flat designs and zoomed sections of the designs if there is any fine details. Creating this pack has made some great additions to my portfolio that I can use in my applications for jobs once I graduate. Below you can see examples of design pack pages that I have designed although these aren’t being carried forward into production. A useful addition to my skills I learnt this week was how to create and fill your own mesh pattern on illustrator for flats. To create a mesh I learnt how to use new tools on illustrator that I haven’t previously used, this skill will be useful for my final year if I choose to make a collection as I struggle with hand movement. Understanding and being able to draw accurate flat designs will allow me to design a collection as I want it without having to struggle because of my hands, the CAD designs allow another person to look at my designs and construct the garment even without my presence with may be useful for my final year. However this week I was also offered an amazing opportunity to go back to Bottle Blonde and work on their new items going into manufacture soon. I simply couldn’t turn down the offer so this week was my final working for Boodica. It’s been an intense 2 weeks creating a set of 6 items ready to be sent off for manufacturing however I’ve learnt somethings about the industry and I’m thrilled to be going back to bottle Blonde. As I currently have more personal time I have started to think more about my plans for my final year, I have started to research places that inspire me and could be the base research of a beautiful collection. I feel strongly currently that I want to incorporate my own print designs into my collection however I need to think about what I wish to design my prints for whether it be women’s wear, men’s wear, kids wear, interior and furnishing or something else entirely. Last week was my final week at Bottle Blonde and this week I moved onto a very different internship. For this internship I actually get to work from home, or wherever I choose as it’s all done remotely. I’m working for a new brand named Boodica who are a women’s wear clothing brand. 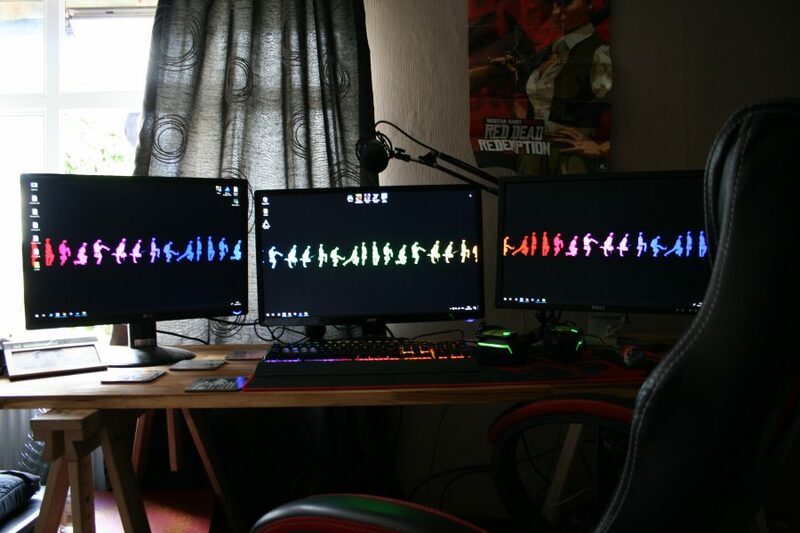 I was and still am a bit nervous about this internship most of all because of the element that drew me towards it in the first place – working from home so below you can see my new work space. I know I have the skills and software and such required to do this job however the sense of freedom and choice in design without a continuous eye looking over my shoulder or someone I can run to and get an approval from in 30 seconds scares me as it’s not my decisions that are the final ones. Of course I do have communication with the company however it’s all via email, phone and skype, on occasion if I need something teaching to me for example spec pack writing I can meet up with a person however this won’t be on a regular basis. My previous internships I have worked full time everyday however for this one as I am working from home I am only working 3 full days with the remainder of the week to myself however it is only a short internship so we shall see how I get along it could be extended. This reduce in my amount of work allows me to have time to think and organise research trips and disability meeting in preparation for my final year which is a refreshing change in comparison to working full time. One of the key skills I am learning on this internship is self motivation and self confidence. I am making most of the decisions in my designs unlike my previous placements I have more freedom of choice which means I need to be more decisive when researching and designing. Personally I have lacked self confidence in the past especially when designing however after several months and internships I feel a lot more confident in this role than if I had began with this placement. However because I am working remotely it is important that I have good personal timekeeping otherwise I could end up overworking myself or not completing my hours of work. From researching and designing then developing to the final garments design at university I understand how much time is required to create good designs and therefore how many I can produce in the amount of time I have whilst working for Boodica. 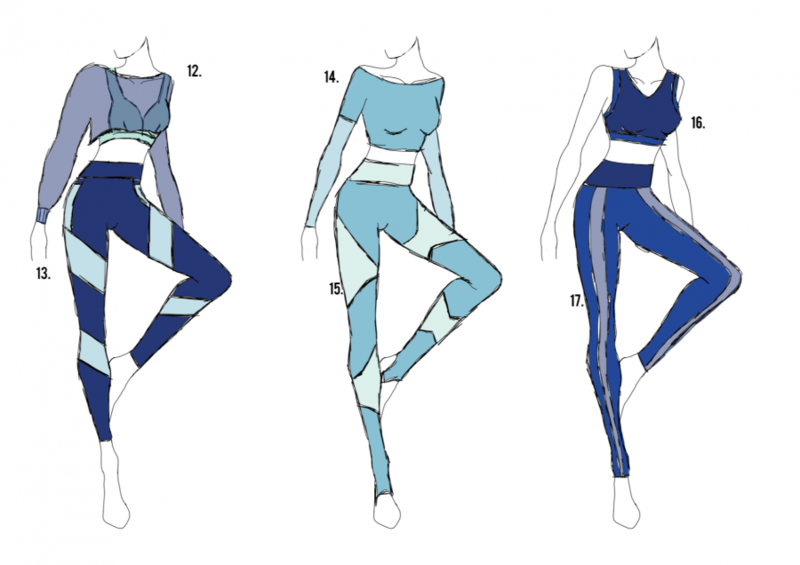 Going back to my actual placement at Boodica my job role is designing Gym wear, this role was unexpected but I am working my hardest with all my skills I have learnt from previous internships to create good designs that are functional and innovative. Personally I don’t go to the gym, I don’t workout ever, running for the bus is about as much exercise as I ever do but I am up for the challenge being a woman who loves to wear leggings but also finds them inconvenient or a pain to wear generally. I began my week doing my trend research which will continue to expand and increase as I design more and more. 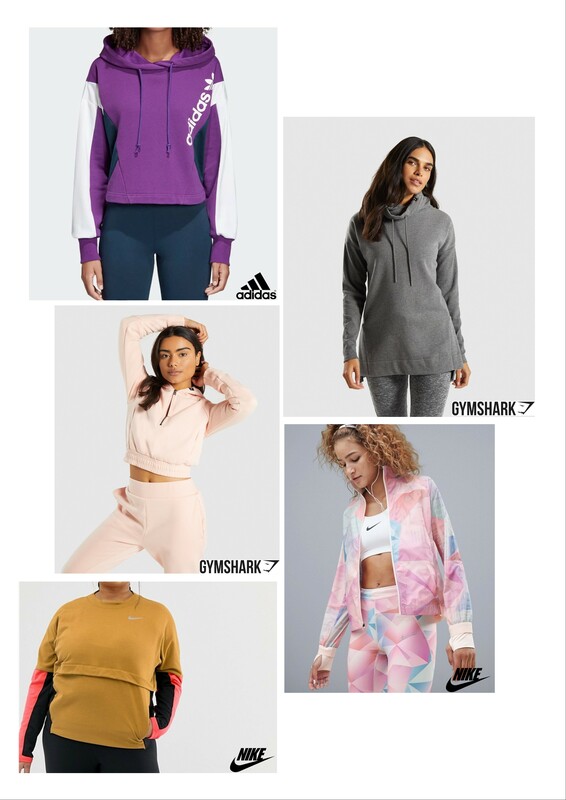 I used well known gym brands such as GymShark, Nike and Adidas as well as general fashion brands such as ASOS, H&M and Primark to research gym wear and the types of garments people choose to wear for workouts or throw on after which I compiled into trend boards to reference when designing an example of a trend board is above. From there as with university projects I began designing, however I don’t want to just mass produce designs with the majority being virtually copies or rubbish. I focused on designing a 3 outfits across my 3 days of work to allow myself more time working on each garment and not cause myself stress. At the end of the week with my completed designs I emailed them onto my overhead at Boodica and happily relaxed for the weekend as I have decided to make sure to request no responses to my work until Monday otherwise I will overwork, over stress and generally destroy my mental health. In my personal life this week I have had rather a busy week. 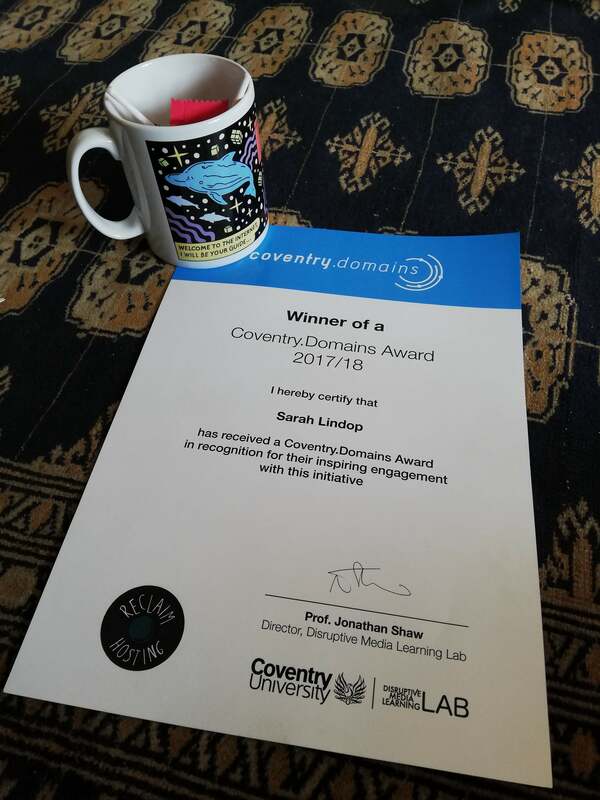 Mid week I was fortunate to be awarded with a certificate and little gift by the coventry.domains faculty of the university for my hard work, use and content of my blog! I attended a presentation at which staff members of different faculty explained how the integrated using coventry.domains into their courses and how it expanded their students CV’s, however I was there because I took an experimental advantage course on how to set up your own domain in my second year which I then have made over several times for different reasons and now use as my placement year blog. I felt very honored to be given the award and the general use of it has helped me grow as a person and inspired me to do other projects involving blogging and learning html coding. 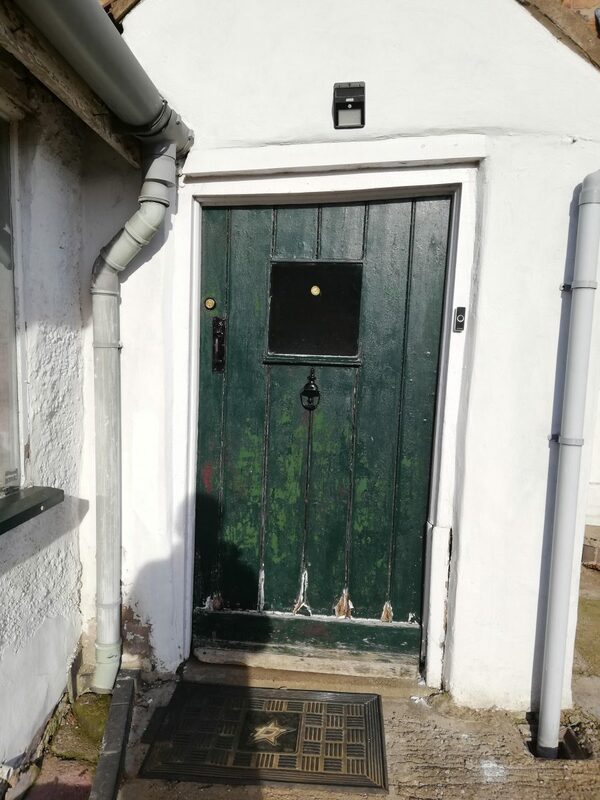 I also had a very busy weekend with a planning meeting for a Girl Guides trip I have planned for this summer which is in its final stages and I am excited to go on. We are traveling across several countries in Europe and writing a story as we go, hopefully this trip will also be an excellent opportunity to get some primary research for my final year collection. As I’m sure you all know this week was Valentine’s day and as such we have been selling Valentines cards in the past month’s run up to the big day. 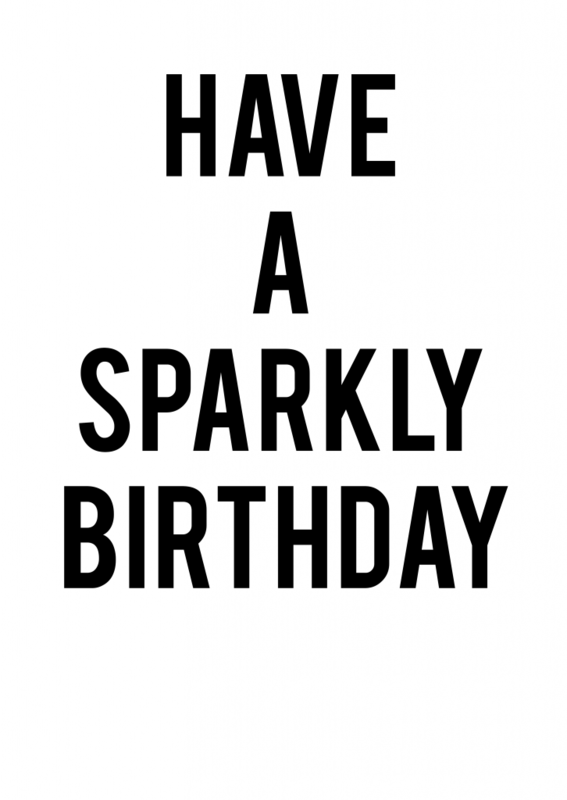 The cards have been selling really well and therefore Chloe asked me to design some similar cards but for Birthdays. 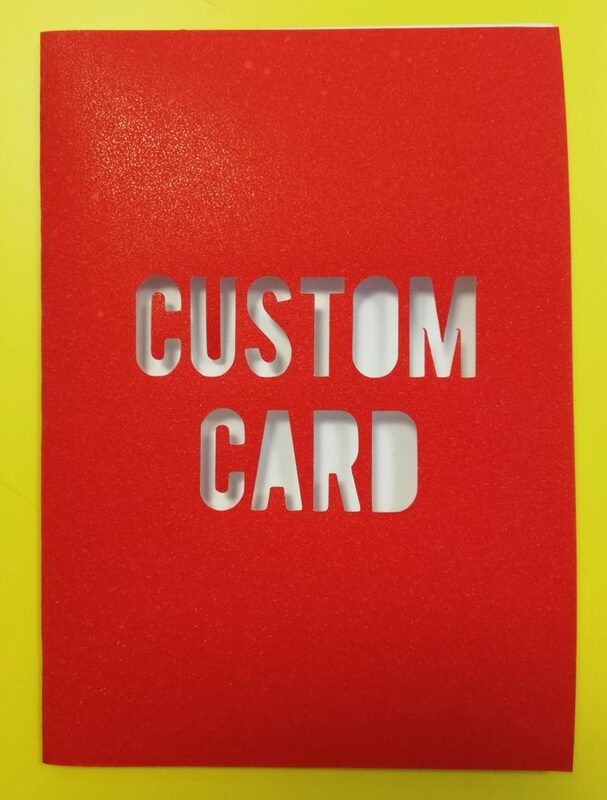 They’re designed to be simple to make with cut out lettering in coloured card, glittery card of course. 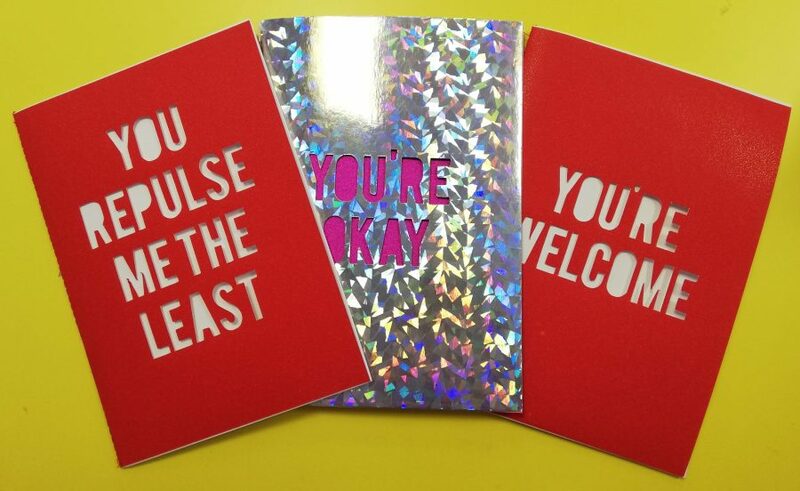 The brand is very sassy by nature so the cards must also be accordingly. 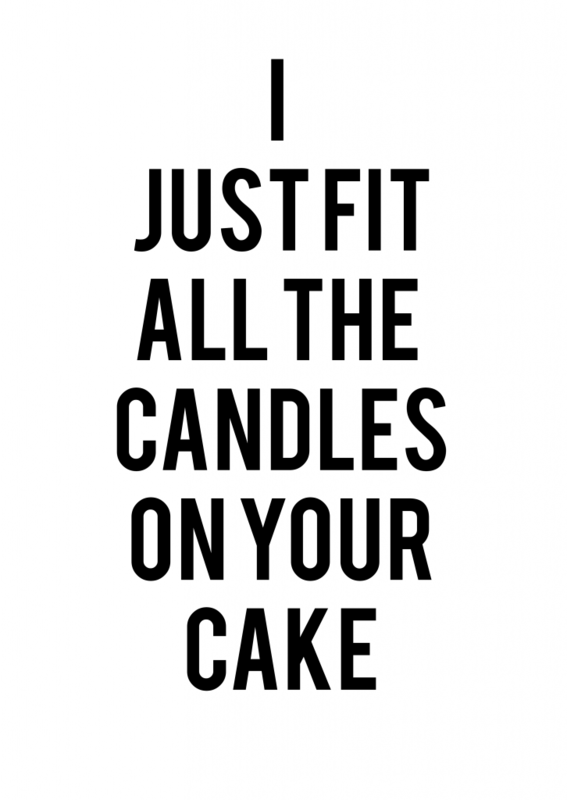 I looked for inspiration using Pinterest, the go to for creatives research and the current valentines to think of phrases for the cards. I managed to come up with around 20 cards by the end of the day, 15 of which were hit’s with Chloe so pretty successful designing. Hopefully they will all sell well for the brand once they are released however for now here are a couple of designs that didn’t make the cut. My role at BB has mainly been graphic design and print design, however this week we had a rush jacket to make and the whole studio got hands on sewing, tapping and cutting to make it happen. I assisted in tapping the tinsel so it’s ready to be sewn onto the fabric. We tape over the top of all the tinsel to strengthen the plastic, reduce how easily it can break and make it easier to sew. I found out however because of my hands and not sewing or doing anything hands on for a while that I struggled quite a lot to tape tinsel. Although this was only a minor issue because of how many people were helping it did make me consider that I should get in contact with my lectures to find out what options I have for help in my final year. Finally, this week was my last week working at Bottle Blonde and I’m sad to be leaving. I’ve loved my time working at Bottle Blonde and had a great final week. At Bottle Blonde I have gotten to learn about a variety of things including print sizing retro designing, social media, web design and much more. 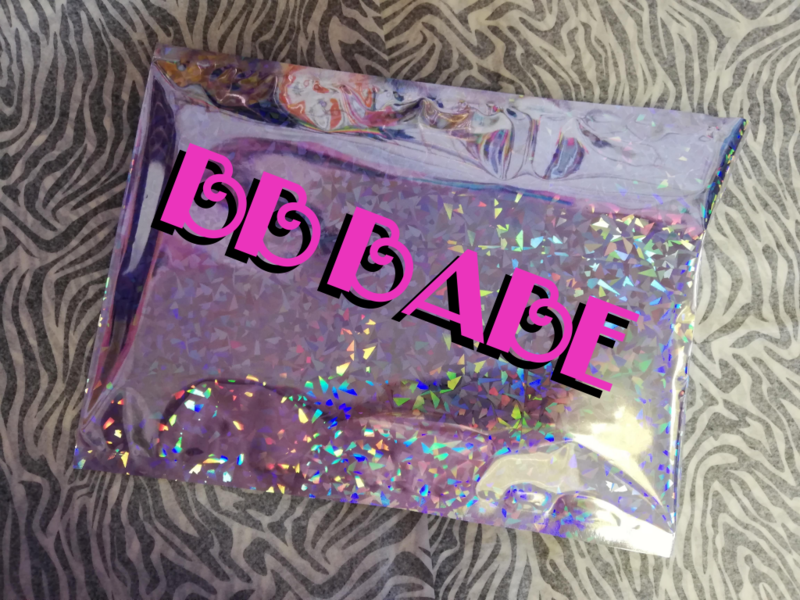 Working at BB has made me reconsider my ideas and goals for final year and thereafter, I feel more inspired to consider if I could run my own business after I graduate and what type of products I would produce. I do however regret during my time at Bottle Blonde not getting a bit more hands on making products whether that be accessories or jackets to improve/ practice my sewing skills I have learnt at university. After I finish my final placement I am considering coming back to Bottle Blonde to develop more skills and portfolio work, hopefully expanding my skills in more sectors of the fashion industry as well as learning more about how the company is run. And this week in my personal life I have started to work on the other parts of my module. For uni I must keep a blog then create a poster advertising why other students should do a placement year and update my CV. So far when I have started a new placement I have remembered to update my Linkedin and have made several adjustments to my CV. 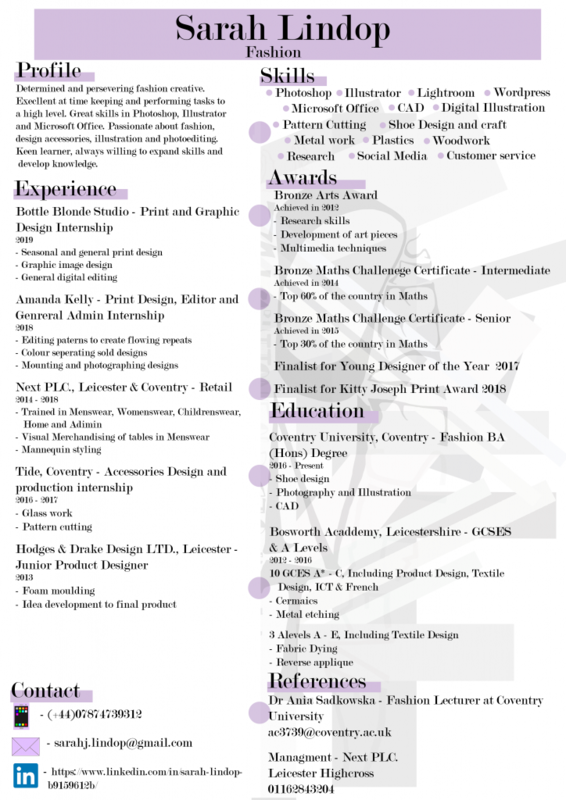 From working in London and now Coventry I have learnt several tips about what to and not to write on my CV as well as layout you can see an edition of my CV above. Prior to beginning my placement year I had a pretty strong CV however I have learnt that rating your skills on your CV is something that really puts employers off as it’s virtually meaningless. Employers appreciate seeing any qualified skills listed on your CV for example if you have a certificate in Adobe Photoshop, however listing Microsoft Office under skills then having a level bar or dot system is meaningless to employers. Since learning this I have rearranged my CV to list all my skills however without the ratings which has allowed me to list more skills and create more space on my CV. I have also started to design my poster advertising to over students why they should do a placement year, so far I have worked in 2 very different cities for 2 very different companies however doing similar jobs at both. I have decided to design a poster advertising each of my placements and possibly one showing all 3 to then choose the best design for submission. At the moment I have only designed my poster encouraging students to come work at BB. When designing this posters I used skills and imagery I learnt and created at BB. So far I love my poster and think it’s a good advertisement it will still be developed prior to hand in. I personally see how much I have learnt from my intern year from how much easier it was for me to design this poster professionally than if I had been set the same task in my second year.